The enormity of history can sometimes be unkind – it makes facts charade as fiction while fiction often assumes the garb of a fact. The Sardar Sarovar project (SSP) is one such issue. So much water has literally passed under the bridge that statistics jump at you with a vengeance. Belying the layering, however, the matter is quite simple. Most notions of ‘development’, like electricity, are charted along a path of least resistance. The ‘costs’, often, are paid by people whose negotiating capabilities are almost nonexistent. If nothing else, this is a disquieting proclivity. Whether the benefit accrued from the ‘development’ is worth it or not is a different debate and may vary from case to case. Barely a fortnight into his government, prime minister Narendra Modi called an emergency meeting on June 12 and cleared the raising of the SSP dam height from its present 122 metres to its final 138.68 m (455 feet). Though SSP-construction violations have happened through successive regimes, the alacrity with which the new government took the decision has surprised many and brought the issue back to national focus. As Governance Now went to press, Medha Patkar, the public face of the resistance to Sardar Sarovar, was sitting on a protest dharna in Delhi. The SSP, first proposed in 1946, became part of the Narmada valley development project (NVDP) in 1964. NVDP comprises 30 large dams, 135 medium dams and 3,000 small dams. SSP is the world’s second largest concrete gravity dam. It has a riverbed powerhouse, transmission lines, the main canal, sub-canals, a canal powerhouse and irrigation powerhouse which taken together are called the SSP. The SSP at its full reservoir level (FRL) of 455 feet will impound water at Navagam and Kevadia in Gujarat. The main canal leading from the reservoir is scheduled to be 450 km long, eventually reaching Rajasthan. Secondary canals, which are to deliver irrigation water to farmers, will total 75,000 km. SSP is being implemented by the Sardar Sarovar Narmada Nigam Limited (SSNNL), wholly owned by the Government of Gujarat (GoG). An FRL of 455 feet will submerge 37,533 ha of land in 245 villages across the three states of Madhya Pradesh (MP), Maharashtra and Gujarat. The canal distribution network will take another 80,000 ha. Though the idea of damming the Narmada goes back long years, the implementation has been complicated by the fact that the river passes through three states raising issues of cost-and-benefit sharing of the projects. In 1969, the Narmada water disputes tribunal (NWDT) was created to decide on the matter. In 1979, the tribunal handed down its award for distribution of benefits. It accepted the flow of Narmada as 28 million acre feet (MAF). The SSP is designed to divert 9.5 MAF of water into a canal and an irrigation system of which the tribunal apportioned 9 MAF to Gujarat and 0.5 MAF to Rajasthan. The hydroelectric benefits, however, were to be divided among the three riparian states. Since the SSP is one of the largest water resources projects ever undertaken, its impact extends across a vast area affecting a huge number of people, mostly tribals from Gujarat and MP. The official statistics peg the number to 51,000 families (more than 2,50,000 people) who will be affected by SSP alone. An analysis of data from government, independent sources and non-governmental sources indicates that there may be an exaggerated perception of the benefits that would accrue from the SSP, while at the same time there is a great underestimation of the number of people whose lives will be irreversibly altered and the extent of adverse impact on the environment. Before the Morse committee, the Schudder report and subsequently the Pamela Cox committee – both employed by the World Bank – were highly critical of the SSP. Though NWDT has assumed a Narmada flow of 28 MAF, data between 1948 and 1993, show that 75% dependable flow has only been 22.69 MAF. This revised estimate reduces the flow of water to Gujarat by at least 18%. Moreover, though the actual irrigation efficiency in India is in the range of 20-35%, the irrigation efficiency is often assumed to be 60%. Because such is the case with the SSP, the actual availability will be half the availability of water at design. One of the main justificatory premises on which the SSP is based – providing water to the arid zones of Kutch and Saurashtra – is also proving untenable on many counts. According to the original plan, the dam was to irrigate 17.92 lakh ha land in Gujarat and 73,000 ha in two districts of Rajasthan. The efficiency of dam-based irrigation is highly dependent on the development of the command area through a network of minor and sub-minor canals. In the SSP, the command area development work is seriously lagging behind. The Gujarat government has admitted that 51% work on branch canals and 79% on sub-branch canals remains to be completed though construction work on the main dam began in 1987. Since Kutch and Saurashtra are at the tail end of the SSP, they will be severely affected by the water shortages in the system. Most water is likely to be consumed by the sugarcane plants and other industries of central Gujarat. It is important to note that only 1.6% of the total cultivable land of Kutch and 9.24% of the cultivable land of Saurashtra are in the SSP command area. The Tata Institute of Social Sciences (TISS), which was the official monitoring and evaluation (M&E) agency for the rehabilitation and resettlement of SSP oustees from 1987 to 1994, found that Saurashtra has received only 20% of the water supplied through the Mahi canal whereas 80% has been diverted to power plants, industries and city corporations. A CAG report of 2006 indicates that overall allocation to industries went up from 0.20 MAF to 1.00 MAF, which also meant a reduction in domestic use to 0.06 MAF from the original allocation of 0.86 MAF. Even after the dam achieved the height of 121 m, only about 29-31% of target villages in Gujarat have been receiving regular water supply, according to the CAG report. The SSP is designed to have a combined installed capacity of 1,450 MW at its present height. But the Gujarat government figures show that firm power generation will drop from 425 MW in the first phase to 50 MW at full irrigation development. Additionally, at 18% less water available in the river than what has been assumed by NWDT, the power benefits will go down even further. As for the human cost, the project stands on an even shakier ground. The government estimate of 51,000 families is a conservative estimate compared to the number of people who will actually get affected by the Sardar Sarovar main dam and its associated canals and sub-canals. Incredulous as it may sound, people in village after village have to rebuild their homes after every monsoon due to the backwater effect of dams, in this case the SSP. The backwater level, calculated as the highest level the water has reached in the past 100 years (in developed countries, it is the highest level in past 1,000 years), is 144.92 m as per the MP government’s calculations. However, records show that backwater level had reached 150 m in 1961, 149 m in 1994 and 147 m in 2013. Therefore, the submerged villages that lie between 145 m and 147m are not counted for compensation by the government. Tribal inhabitants of Nandgaon village pursue farming. Backwater submergence has brought water to Geeta and Savitribai’s doorsteps. Their family’s farm land, which is at a lower altitude, is completely submerged whereas the house becomes uninhabitable in the monsoon. 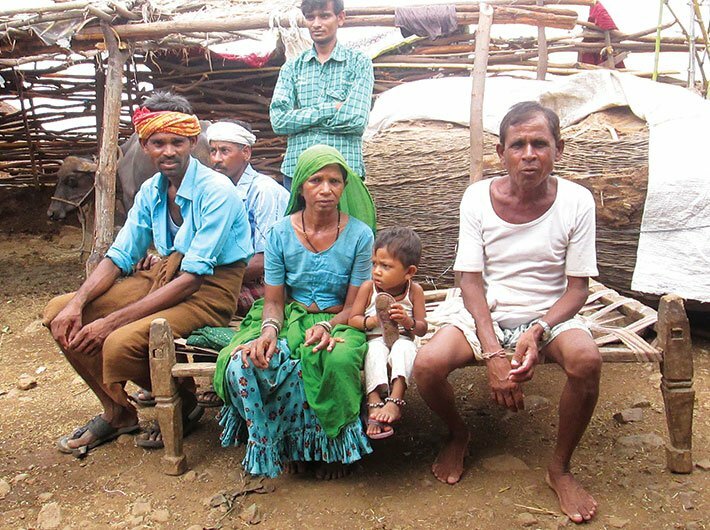 Every monsoon theirs and other families from the village are compelled to shift to their relatives’ homes in the nearby resettlement colony till the water level subsides. Daulat Ram, also from Nandgaon village, has recently shifted to the Jamda resettlement site. His land, house, water sources on his farm etc. are submerged. As per the MP R&R policy, he is entitled to 5 acres (2ha) of land. The policy states that any person from whom more than 25% of land has been acquired by the government is entitled to 5 acres along with his major sons. In the last four years, Daulat Ram has received only half the compensation amount of '2.50 lakh for about 5 acres of his land. He has not received any compensation for his house or other immovable properties on the land. He is now building his own house in the resettlement colony. Only 30 families have till date received land for land in MP. Interestingly, the villages which are slated to be submerged, called doob gaon, quickly acquire a cultural stigma that makes the life of still-residing people even more unbearable. For instance, across doob gaon girls find it difficult to get married and men to get loans. Authorities stop providing various services to the villages (no new roads, schools, medical facilities etc.) even when an alternate resettlement site has not been provided to them. MP has earmarked a total of 88 resettlement colonies. Many of the families have been given resettlement sites with major waterlogging issues and drainage problems making habitation impossible. The Amlali resettlement colony boasts of a number of facilities printed on a board on the main road: anganwadi centre, health centre, granary etc. However, it is deserted. The tribal occupants preferred going back to their submerged villages than to settle here. Across these sites, problems of drinking water, grazing fields for cattle, places for cremating or burying the dead, drainage and schools are major problems for the oustees. Moreover, people from one family are scattered across different resettlement sites, sometimes hundreds of kilometres apart. This seems to be a mockery of the MP R&R action plan which states, “Displaced families would be rehabilitated, maintaining the existing structure of social groups.” In many cases, a resettlement colony is allocated that could be some 40 km away from the affected family’s farming land. Asked if he has had a look at the resettlement colonies, Badwani district magistrate Shobhit Jain only said, “Yes, work is on. The resettlement colonies have beautiful temples – even better than the ones they [the oustees] had in their villages.” However, it was more than clear that the oustees had many more immediate concerns to address than having access to beautiful temples, important as the gods residing in them may be to the oustees’ survival. MP and Maharashtra do not have enough land to resettle the families being displaced. Since Gujarat has a better R&R policy on paper, MP and Maharashtra started sending their tribal oustees to Gujarat. The campaign called ‘Chalo Gujarat’ is a near disaster. Apart from the obvious problems of cultural differences, language problems and the host communities not accepting the ‘intruders’, some families found their land barren and returned to MP. In 2001, in violation of the supreme court guidelines, MP government came up with a special rehabilitation package (SRP) which provides cash in lieu of land. Many of the villagers I spoke with said the NVDA officials ‘encourage’ the oustees to opt for SRP. The cash compensation is given in installments; in some cases it has come in five installments spread over eight years. By the time the full amount comes, it proves inadequate as a replacement value for the land originally owned. Rajaram from Morkata village has only received '2.5 lakh as first installment over the past several years whereas land price in that locality in the intervening period has risen to '11 lakh per acre. Moreover, a flouting of the prescriptive requirements of supreme court orders vis-à-vis the SRP has led to the emergence of middlemen and profiteers floating around the illiterate tribal villages. Villagers say that in some cases the cash has been disbursed in the middle of the night. Many cases of fake registry of sale deeds of land have been recorded across seven districts. The Jha commission has been set up by the MP high court to look into these irregularities. Its report is due in October this year. It would require a leap of insanity to argue that villagers in Saurashtra and Kutch should not benefit from drinking water. But is the Sardar Sarovar about drinking water? Have emotive assertions been substituted for rational decision-making? The SSNNL website declares: “For every tribal displaced, seven tribals benefit.” What fair logic does one employ to compare providing water to 7,873 villages by impoverishing and rendering destitute 2,50,000 people? We can do better than that. The idea of development, as it stands today, is set to devour its own purported beneficiaries. The Sardar Sarovar dam, a gravity dam on the Narmada river near Navagam in Gujarat, is part of the Narmada valley project which includes 30 mega dams and a series of small dams. The project took form in 1979 to increase irrigation and produce hydroelectricity. World’s second largest concrete gravity dam (by volume) after Grand Coulee. 51,000 families, or more than 2,50,000 people, as per official data. Activists claim far higher figures.